A clean house should have a clean bathroom and a clean kitchen, thus making tile and grout cleaning very important. 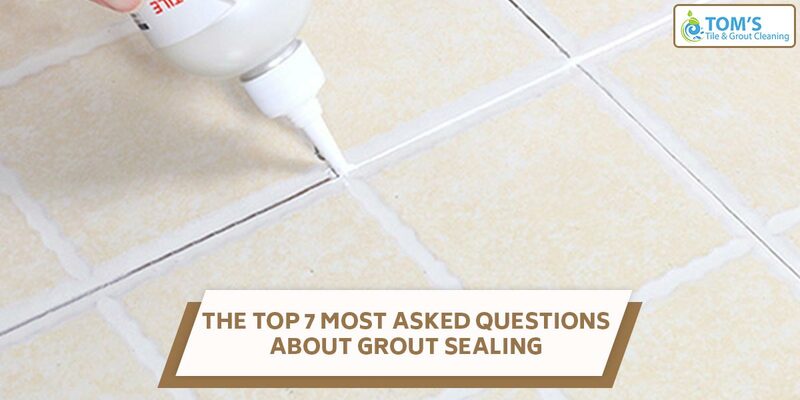 Here are the most asked questions about grout sealing. Read on to know more about tile and grout cleaning. FAQ 1. What Is A Grout Sealer? It is a substance that seeps into the pores of grout. It comes in liquid form or gaseous form. It is viscous transparent or white when in liquid form. FAQ 2. What Is Grout Sealing? The grout between the tiles is always made up of sand and sand by nature is porous. Grout sealing prevents any kind of moisture from working its way up to your tiled walls. Grout sealing is most preferably done during the tile and grout installation process. A grout sealer, when applied on the grout, fills in the pores of the grout not keeping any room for moisture to seep in. FAQ 3. Why Is Regrouting For Bathroom And Kitchen Tiles Necessary? Grout Cleaning is a temporary solution for making the grout look bright. The continuous flow of water, soap, steam, gravy and what not takes a toll on your tile and grout, especially the grout. The grout seems to lose its colour, luster, and it becomes porous and starts peeling off. This is the time when you will have to get grout sealing done. FAQ 4. When To Carry Out Grout Sealing? As mentioned above it is done during the installation process, but it is okay to seal the grout later on. Grout sealing is a tricky job and it needs to be done with caution. Consider for example that you are sealing the grout of your bathroom you will have to wait from your tiles and grout to get completely dry, and even free of moisture from within. The tiles that do not get wet regularly the walls where shower water does not reach should be left untouched by water for 48 hours. Other water prone walls should be left untouched by water for 4-5 days. Only after this time grout sealing should be carried out as sealing the grout with water inside them can cause severe problems. FAQ 5. How Much Grout Sealer Is Needed? The amount of grout sealer depends on the size of the tiles. If you have large tiles than you will need less grout sealer in comparison to grout needed to seal the grout in mosaic tiles. FAQ 6. How to Apply The Grout Sealer? Use a pointed brush to apply grout sealer between the tiles. This is harder than the other two methods. Apply the sealer repeatedly to coat the grout well. Works same as the brush. But you have to be less careful as when with a brush. Easiest of the three methods, but you may have to do a lot of tile surface cleaning afterward. Do not spray on unglazed tiles, as removing the seal from them, later on, would be difficult. FAQ 7. How To Get Grout Sealing Done In The Easiest Of Ways? Call a tile and grout cleaning professional for a free inspection. Get customized cleaning procedures for your needs. Let them do all the work and save yourself from all the after tile cleaning hassle too. To get grout sealing done call Toms Tile and Grout Cleaning Melbourne services to get same-day, onsite services, on 1300 068 194.